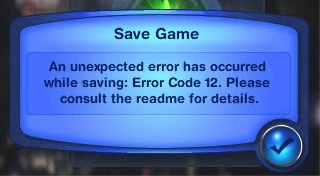 While saving I get the error message: An unexpected error has occurred while saving: Error 12 (or 13 or 15 or 16). Please consult the readme for details. Error 13: Post-save callback failure. Unclear what that means. They fixed an error that was causing this and it seems to not occur as often. Error 15: Open failure. You probably don’t have enough rights to write in the folder. Error 16: Loose file copy failure. The file cannot be (over)written. Since Error 12 seems to be caused by memory issues, a 64-bit operating system and at least 4 GB of RAM help avoide this error. EA altered the executable file with Patch 1.17/etc so that the game can allocate 4 GB of RAM. If you are on a 32 bit system you can try the suggestion here Game Help:Insufficient Memory Crashes, Step 3. I do not really recommend it, especially for non-tech people but you can do so at your own risk. Save often and in cycles (5-10 savegames with different names or use Twallan’s Saver Mod to auto save. Regularly backup your user files. Check the folder CurrentGame.sims3 before starting the game. It should be empty. It only contains data during gameplay. If your game crashed, this folder might still contain something. Move or delete it’s content. Make sure your saves folder doesn’t contain any saves with the extension .bad. Delete those, they are unusable. Don’t play long game sessions. Quit and restart the game in between. Since Patch 1.42 you can turn off automatic memories. You can try the following suggestions while the game is running and then try saving again. As soon as you get the error, the save is written to a folder with the extension .bad. You’ll find it in your saves folder. Delete that folder before continuing. Try saving your game paused and unpaused and at different speed levels. Never use save & quit. Always save your game first and then quit the game without saving. Don’t use spaces or special chars in your save game names. If you have lots of stuff in your inventory, reduce it. If all fails, quit your game without saving and restore a backup. Error 15 occurs when you don’t have enough rights to access the saves folder. Make sure you have full access to the folder your saves folder is in and it’s not hidden. If nothing helps, start your game as an administrator. Error 16 occurs because of a file system failure which can occur if you try to overwrite a file in use or that is corrupt. Saving as with a new name should solve the issue. Also make sure you have enough disc space available.